Thanksgiving is a busy weekend in Northern Michigan as several special events kick off the holiday season in style. While Black Friday is busy everywhere, in Northern Michigan it is more personal with shopkeepers greeting you to announce their specials. Petoskey helps march in the holidays with the Stafford's Holiday Parade held the Saturday after Thanksgiving at 10am in downtown Petoskey. This fun event includes marching bands, floats by local businesses, marching characters, and much more. The parade is wrapped up by its most popular participant, Santa Claus. After the parade, he will greet children on the Veranda at Stafford's Perry Hotel and listen to all of their Christmas wishes. Bay Harbor decks the halls for a holiday open house on Saturday of Thanksgiving week 4-6pm. Boyne City hosts a parade on the day after Thanksgiving at 6pm followed by a merchants' open house 6-9pm. Shoppers love Earlier than the Bird shopping with great specials 7-11am, the Saturday before Thanksgiving. Charlevoix kicks off the holiday season on the Friday after Thanksgiving with a tree lighting festivities at 3-6pm. The Charlevoix Circle of Arts will have crafts and cookie decorating for children from 3-5pm. Photos with Santa can be taken at the Charlevoix State Bank. Free cookies and hot chocolate will be offered at the tree. The Christmas parade begins at 5:30pm with the tree lighting at 6pm. Cross Village starts the Christmas season with a Tree Lighting complete with music, food, and festivities at Three Pines Studio. Held the day after Thanksgiving, Friday, this is a community event takes place 11am-7pm with the tree lighting at 5:30pm. 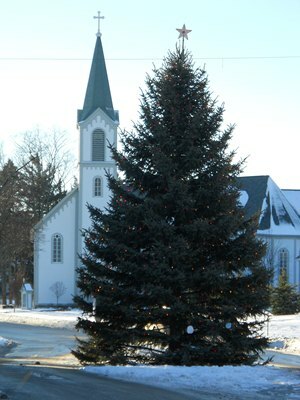 Harbor Springs begins the season with the annual Tree Lighting ceremony the Saturday after Thanksgiving at 6:30pm. Each year, a local family donates a large tree that is placed in the center of Main Street in front of Holy Childhood Church. The townspeople gather in front of the tree to sign carols and then a switch is turned and the tree--and all of the lights in the trees along Main Street--come to life. Indian River celebrates the day after Thanksgiving with a day long craft show followed by parade at 5pm and the merchant's open house 6-9pm. Mackinaw City starts the season on the first weekend in December with Christmas in Mackinaw including a parade and tree lighting at 5pm on Friday followed by a sleigh rides and holiday activities all weekend. Start your holidays in style with these special Northern Michigan activities!